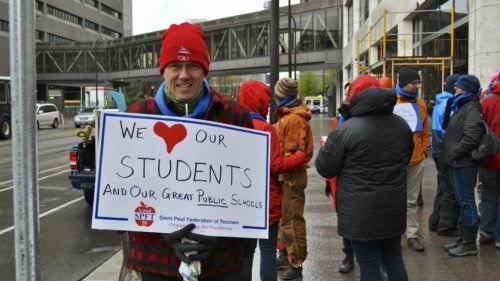 Member Kent Sall attends the May Day Rally in downtown Minneapolis to support immigrant students. 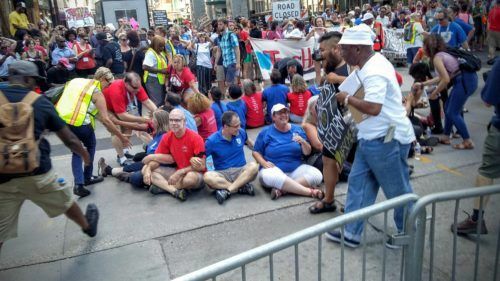 SPFT organized a march at the AFT national convention in 2016 with the Minneapolis Federation of Teachers and Neighborhoods Organizing for Change to protest the killing of Philando Castile. Executive Board Member Bernetta Green and President Nick Faber attend the 2017 Contract Campaign kick off at US Bank. The Saint Paul Federation of Teachers believes that teaching is an inherently political act. We encourage and support each and every student who comes into our schools to reach their full potential. We do not turn anyone away. When our public schools work, they act as a safety net leveling the playing field for our collective future. Unfortunately for far too many students, our public schools have not worked. This is especially true for many of our students of color. While Minnesota has some of the most highly-ranked public schools in the country, this ranking only holds true if you are a white student. Our public education system does not have to be this way. 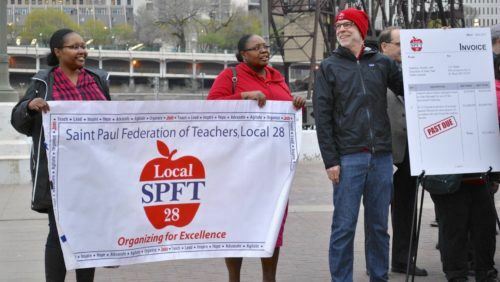 To fight for racially equitable public schools, SPFT advocates for our members, our students, and our community at the bargaining table and in the streets. We lobby elected officials, march at rallies, and hold one-on-one conversations to organize our friends, neighbors, and colleagues. We believe that public education is worth defending because only our public schools, which teach all students, can prepare our children for their roles as citizens in a more diverse future.